What is The Ultra Fit "TEAM" Concept? How are Ultra Fit Trainers different than other trainers in other gyms? What Makes Ultra Fit Different? 1. 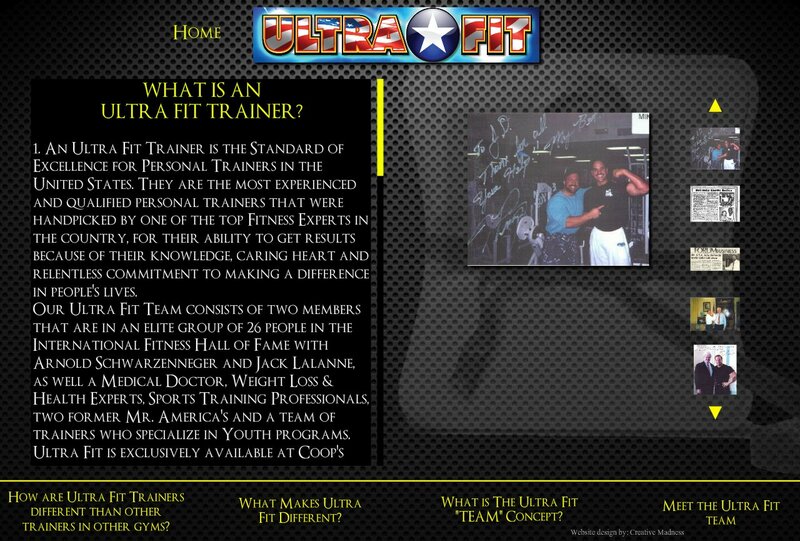 An Ultra Fit Trainer is the Standard of Excellence for Personal Trainers in the United States. They are the most experienced and qualified personal trainers that were handpicked by one of the top Fitness Experts in the country, for their ability to get results because of their knowledge, caring heart and relentless commitment to making a difference in people's lives. two former Mr. America's and a team of trainers who specialize in Youth programs. Ultra Fit is exclusively available at Coop's Health & Fitness in Greenville, Spartanburg and Anderson, South Carolina. 2. Our Ultra Fit Trainers, program and clients have been featured on almost every major television show because of the great success of our program and trainers. We have been featured on ABC televisions 20/20, Good Morning America, Hard Copy, CNN, ESPN, FOX News, WYFF-4, WSPA's Your Carolina, The Joan Rivers Show and NBC Sports, to name a few. Ultra Fit has been implemented for over 29 years and has helped tens of thousands of people achieve great results in weight loss, health, fitness and sports. We have also taken more than 100 pounds off of more than 300 individuals right here locally in South Carolina with Ultra Fit! 3. Our Ultra Fit program was designed in 1982 by Mr. USA John DeFendis and he currently directs and supports the program today. Mr. DeFendis is in the Fitness Hall of Fame with Arnold Schwarzenegger and Jack Lalanne and he was awarded Trainer of the Year for 9 consecutive years while also holding the position of Master Trainer at the Congressional Gym in Washington DC. John DeFendis is a world renown fitness expert who is also a newspaper columnist, radio personality and has been on 24 International magazine covers for his work in fitness, health and bodybuilding. John has also performed thousands of weight loss, fitness and motivational seminars around the world over the past 30 years and has implemented the Ultra Fit program and successfully trained celebrities like Speaker of the House Newt Gingrich, Clothing Designer Calvin Klein, and Baseball player Mike Piazza. The best news is that Mr. DeFendis is always available to assist our clients with their program and motivate them to go after their goals. As an Ultra Fit client, you will have full support from our team of Ultra Fit Trainers at Coop's and access to John DeFendis in a timely manner, with his full support. Ultra Fit is the most effective program in the United States and we are dedicated to helping people reach their goals. I would like to invite you to join me for a free Ultra Fit training session. By taking advantage of our time together, you will learn more about Ultra Fit and how it will change your life. What are the best days and times for you to meet with me for that free workout?